Binary systems are the rule rather than the exception for most stars, so it should not be surprising to find that many Be stars have companions. Unless the separation is unusually small, however, interactions between the two components should not have a strong influence on the characteristics of the Be star. In the case of systems with small separation, the nearby companion may directly affect the Be star, even to the extent of being the source of the gas that makes up the circumstellar envelope. 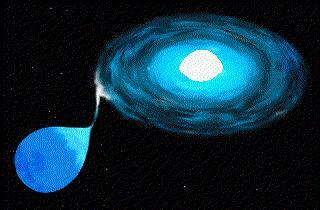 In one proposed scenario the present Be star was originally the less massive of a pair. The companion evolved faster and eventually overflowed its Roche surface, transferring mass to its neighbor to take the form of a circumstellar envelope and create an object indistinguishable from a Be star.